Ather Sharif, who had moved to Philadelphia last year for treatment for a spinal cord injury, knows how important it is for people with mobility issues to plan when using public transportation. Though he was impressed with the accessibility of SEPTA's subways and buses, he saw how quickly regular maintenance issues—a broken elevator at a subway station or construction blocking a pathway—could derail travel plans. James Tyack, a senior software engineer and frequent SEPTA rider, recognized a need. 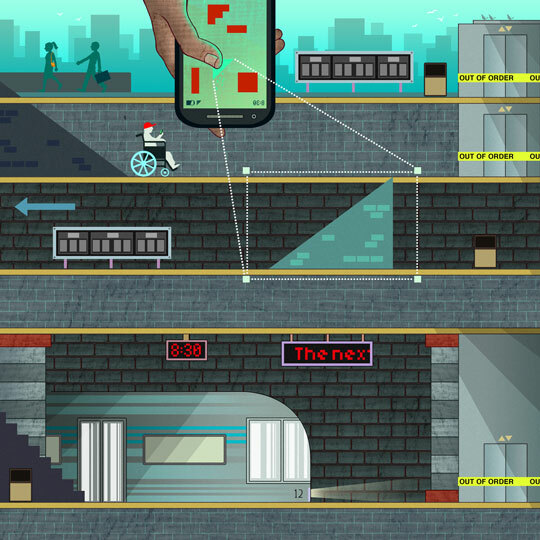 He created a mobile app called Unlock Philly to help people with mobility issues find wheelchair-accessible SEPTA stations, but, with input from the community it’s poised to become a wide-ranging resource for people with disabilities who live and travel in Philadelphia. Unlock Philly can make an impact on peoples’ lives on a day-to-day basis while improving the city’s services, says Sharif, a software developer who is helping Tyack develop Unlock Philly’s capabilities. Powered by data from SEPTA and crowdsourced information, Unlock Philly provides an interactive map of SEPTA subway and high-speed line stops that are wheelchair-accessible as well as up-to-date tweeted information about elevator outages and construction projects that could impede access. Plans are also underway to gather and share accessibility information on businesses and other venues to help make more of what the city has to offer available to everyone. Tyack began building the app in October 2013 at the Apps for Philly Transit hackathon. Tyack, 41, who has lived in Philadelphia for six years, explains that being on public transportation for two hours every day made him very aware of what’s working and what isn’t. He says he created Unlock Philly to help people with mobility issues navigate around the city, something everyone should be able to do. On June 1, Unlock Philly took the top prize at the Hack4Access hackathon sponsored by Technical.ly Philly and The Philadelphia Corporation on Aging. Tyack received $1,000 from Philadelphia Link, an aging and disability resource, to continue developing the app. The Unlock Philly team includes six volunteers, as well as individuals from the aging and disability communities who’ve given input about their needs, says Tyack. Improving transportation for one segment of the population will have a positive ripple effect on the whole community, Tyack explains. Enabling individuals with mobility issues to get to work and travel around the city will help increase productivity and diversity, he says. Wilkerson adds that Unlock Philly’s efforts will also benefit Philadelphia by making it more inclusive for tourists and convention attendees. Unlock Philly taps into SEPTA’s application programming interface (API) for much of its transit information, Tyack says. Michael Zaleski, SEPTA’s Director of Emerging and Specialty Technologies, explains that the transit authority collaborates with third-party app developers by offering the use of its API and by participating in local hackathons targeting transportation issues. Collaboration encourages innovations that might not otherwise be developed if SEPTA had to rely solely on in-house resources, says Zaleski. The Accessible SEPTA web page offers information on travel, assistance, service animals and navigating stations and vehicles. Apps developed by third parties include SEPTA.mobi, an interactive bus route app that shows bus routes in real time and alerts users about detours. An app for the regional rail schedules called iSepta, now defunct, was also been developed. In addition, a number of transit apps and projects that took shape during past hackathons are in the works. Tyack depends on collaboration as well by crowdsourcing and tweeting information related to accessibility problems around the city. For example, on July 2 Unlock Philly tweeted: “Lots of inconsiderate construction in @OldCityDistrict blocking sidewalk #accessibility,” with the time of day and two photos showing exactly what was blocking the sidewalk. Sharif hopes his contribution to Unlock Philly will take community involvement to the next level by introducing the ability to add Yelp-style reviews of a location’s accessibility to the app. The feature is in the testing phase, he says, and is just one of several ideas in the works.